We’ve had intermittent rain and sun, and a huge variation in Spring temperatures from one spell to the next; everyone has had to work hard to combat the threat of mildew as you’d expect in such conditions. But it’s looking good. A few stats, if I may. Rainfall in the period from October 2013 to March 2014 was the highest since 2000-2001. Adding up the rain in ten major sub-regions of Bordeaux, the average for the period was 646mm compared to the 30 year average for Bordeaux (Merignac) of 534mm. March was a little warmer than usual (9.5 to 10.5˚C depending on the sector, compared to an average of 8.8˚C) and rainfall close to the norm of 65mm, with 50 to 85mm depending on the area. Budbreak began early at the start of April and warm, sunny weather in the second week saw a surge in the vines. By mid-month, we were three weeks ahead of 2013 and only slightly behind the early vintage of 2011. 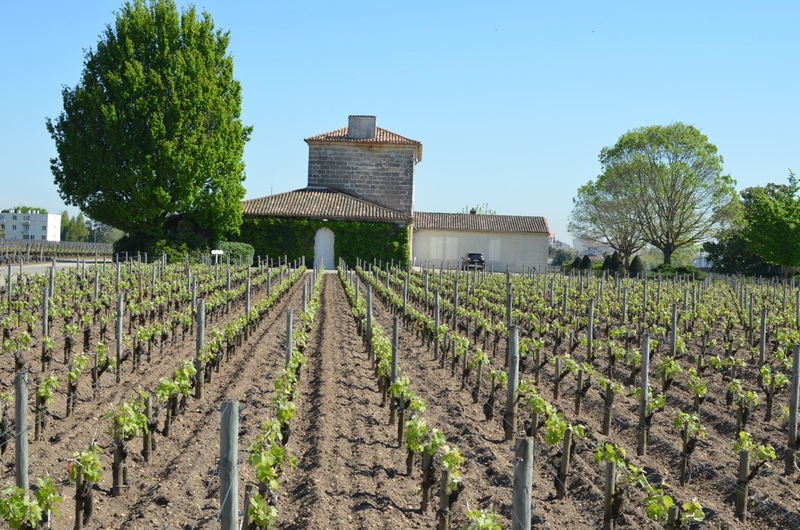 There was less rain in the Medoc (around 50mm) than the average in April (78mm being the 30 year average for Bordeaux Merignac) but rainfall was in line with the norm (St-Emilion 72mm) or slightly higher elsewhere (Léognan 94mm). Much of this rain came on 22 April and at the end of the month, and we’ve had to be vigilant against mildew. Temperatures ended up slightly above the monthly average of 12.4˚C. May has been up and down, and the chilly periods have put the brakes on the rapid early growth. I don’t have the final figures across the board but we saw averages of around 2˚C lower than the monthly average temperature of 16.1˚C. Whereas the Medoc saw less rain than the Right Bank in April, the reverse was true in May. Rainfall was above the monthly average of 80mm in the Medoc and slightly below that in the Libournais and Entre Deux Mers. 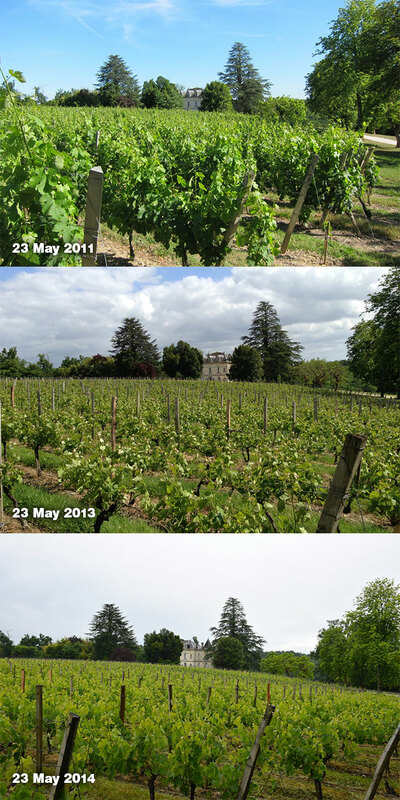 You can see from the pictures of Merlot in our vineyard (right) that we’re some way behind 2011 but well ahead of the retarded 2013. Over the sunny weekend of 1 June, the flowering began in earnest. The earlier-ripening Merlot in the precocious vineyards of Pomerol is usually first out of the blocks, along with Haut Brion in Péssac. 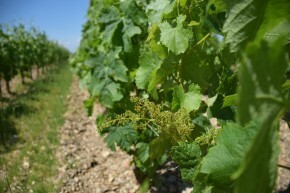 Merlot is in flower at Pétrus, L’Evangile, La Conseillante, L’Eglise Clinet, Le Pin and throughout Pomerol – and beyond. It was a surprise to see some parts of St-Emilion so close behind, and the fact that Cabernet Franc (such as at Angélus) has also started to flower is a good sign. Cabernet Sauvignon will not be far behind if the weather continues to be fine, so an important fortnight lies ahead. The forecast is good for this week, at least, so it’s more than encouraging for the Merlot (so vulnerable to poor fruit-set if it rains) in the warmer parts of Bordeaux. If this sounds too positive a spin at such an early stage, here’s one reason. I wrote several gloomy articles on the prospects last May and June and about the storms in July 2013, and was rewarded – along with hundreds of our neighbours – with a catastrophic dose of hail in August. That’s why, I can assure you, 2014 is going to be terrific. And this year, I’ve taken out insurance.